Crosman 0.20g BBs represent a huge boost in reputation for an otherwise controversial airsoft manufacturer. Bearing no resemblance to their mediocre 0.12g BBs or airsoft guns, Crosman has awoken up with a surprisingly well manufactured ammunition product. They have successfully produced an accurate, durable and well crafted airsoft pellet, while retaining their famously low prices. With only very little room for improvement, the brand have made their voice heard. Crosman 0.20g BBs – perfect product for budget sensitive airsoft beginners. 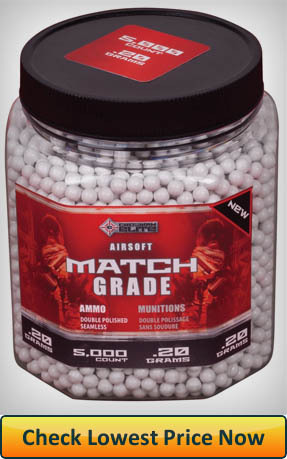 0.20g BBs are to be used mainly by lower powered airsoft guns, in the 280-350 FPS range. If you’re a beginner airsoft player and just picked up your first M4, you’re very well served by getting a container of Crosman’s 0.20g pellets. If you have upgraded your gun or are running a more powerful rig, exceeding 350 FPS, you might be better off taking a look into a selection of heavier airsoft BBs. While they may be designed for “competitive play” and designated “match grade”, I would mainly use them for smaller skirmishes. For high-priority battles and multi day events, I would go with more high quality brands such as Valken, Metaltac or TSD. 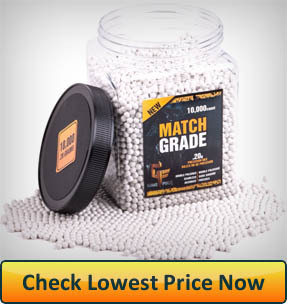 A surprisingly popular choice among beginners, Crosman’s 0.20g match grade airsoft BBs are 6mm(0.236in) in diameter and weigh 0.20g each. They are white in color, though Crosman sells other colors in the same weight bracket. They are seamless, not polished and designed for competitive play. Crosman’s 0.20g BBs come under several different labels: Match Grade, Precision Ammo. They are sold in 2,000 ct bottles as well as 5,000 and 10,000 count plastic containers. Their 2,000 ct bottle is sold as an add-on item only. Crosman 0.20g BBs are not biodegradable, but the brand does carry biodegradable 0.20g BBs. Read my review on them by clicking the link! 0.20g BBs are inherently more accurate during flight and can fly further than 0.12g BBs. However, Crosman 0.20g BBs seem to have issues trying to measure up to competitor BBs of the same weight class. They tend to trail up and go off target more quickly. It’s difficult to ascertain the cause of this. On inspection, the BBs show no dimples, seems or imperfections. Here is my hypothesis: lack of polish. Manufacturing isn’t always a clean business. When not polished, BBs are sometimes not perfectly spherical. These slight imperfections, while invisible to the eye, increase pellet air drag. Any amount of drag will adversely affect accuracy. Polished BBs lack these minuscule imperfections and enjoy a more stable and accurate flight. Crosman’s BBs certainly surpass the brand’s reputation when it comes to their workmanship. Unlike their 0.12g Elite Premier Cammo BBs, their 0.20g version are completely seamless. They also have no visual imperfections or impurities. No dimples, bubbles, creases. When it comes to consistency and deformities, Crosman do seem to perform marginally worse than their competitors. While Frankeinstein BBs are found in almost every batch of pellets, I regularly find several more in Crosman ammo. All in all, Crosman has upped their game in a major way in comparison to some of their 0.12g ammunition products they sell. I have found their 0.20g BBs to be well produced and their manufacturing to be mostly consistent. Despite their popularity, Crosman seem to have issues with shipping and packaging their 0.20g BBs. This may be a problem with a third party fulfillment center and not their manufacturing facility. Either way the result is the same: spilled BBs. Several people have reported that their BBs spilled outside the container and into the shipping box. During shipping, some of these pellets can easily fall out of the box – a disaster. It’s unclear whether this is caused by a malfunctioning lid or negligence during fulfillment and shipping. It does seem to be a recurring issue. I should note that it’s a rare occurrence and you’re unlikely to be affected. The majority of customers will never experience this problem. Even so, Crosman’s BBs come with 90 day warranty. You should be able to contact them and receive a full refund or replacements. Another surprise in the durability department as Crosman 0.20g BBs perform surprisingly well. How reliable and strong a given pellet is depends entirely on the craftsmanship. Well crafted BBs are durable and strong and poorly crafted BBs with seam will shatter easily. As already covered above, the vast majority of Crosman’s pellets are well manufactured and have no major issues. This is the driving factor behind their strength and durability on the fields. You’re very unlikely to have a 0.20g Crosman BB jam on you or shatter inside your gun which is more common with some of the brand’s 0.12g ammo. They have visibly put in a lot of effort into ensuring their 0.20g BBs don’t cause any such issues and perform flawlessly. When it comes to pricing and affordability, Crosman continue the trend of undercutting their competitors. In a market segment where prices are already so incredibly low, Crosman have managed to shave of another 15% from their competitors. In comparison to Elite Force, admittedly at the pinnacle of both quality and performance, Crosman 0.20g BBs come in at almost half the price. Would I spend dollar and a half more for some Valken or Metaltac BBs? Yeah. Will I wholeheartedly recommend Crosman to beginners who are looking for the most affordable BBs – absolutely! Crosman 0.20g BBs will perfectly fit beginners with low expectations of competitive skirmishes. Providing more than enough accuracy, durability and appealing with an exceptionally attractive pricing – Crosman’s BBs are not going to disappoint. Have you recently had experience with their 0.20g pellets? If so, please let us all know by leaving a comment below. If you haven’t – what are you waiting for? In case you have questions or concerns, let me know in the comments and I’ll do my best to respond within 24 hours!